NAV Easy Security Light is an efficient, cost-effective way to maintain security in Microsoft Dynamics NAV, greatly enhancing NAV’s security features - perfect for companies with less complex security requirements. Available for both the Classic Client and Role Tailored Client, Easy Security Light lets you manage access controls and security roles through an easy to use wizard - without modifying the base objects within NAV, so no merging is required. And Easy Security Light is fully integrated with all the features in the Role Tailored Client, such as FactBoxes and the Action Pane. The current version can be downloaded from the bottom of the page and tested in a CRONUS database. Controls Easy Security Light lets you assign security roles to the users with a wizard, allowing multiple security roles and companies to be assigned at the same time. Once a user’s security role and permissions have been set up, they can be copied to other users. Watch this YouTube video to view the features to manage Access Controls. The wizard within NAV Easy Security Light provides a fast, simple way to create and maintain security roles within NAV. 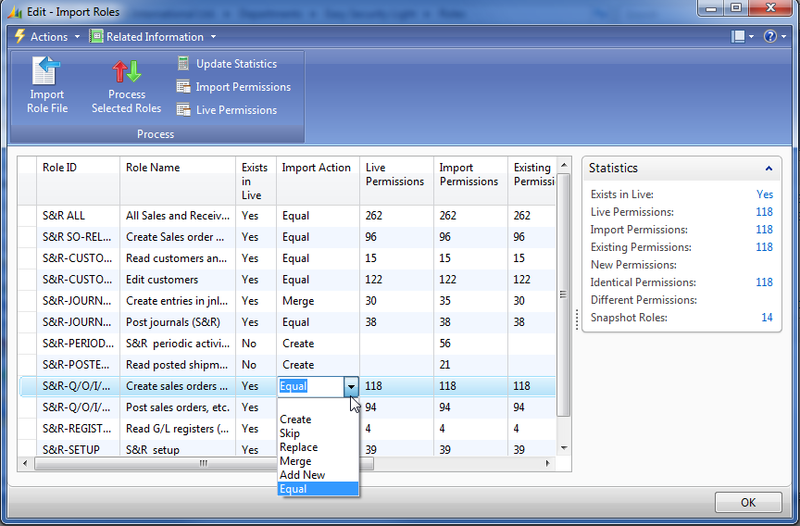 The wizard helps you record TableData permissions when building new roles or updating existing ones. Changes and permissions are recorded by the SQL Profiler, which are then used to build or update roles. The recording process can be performed with the users working from their own computer, simplifying the process and reducing disruption to workflow. Watch this YouTube video to see how to record permissions. You can easily copy permissions from one security role to another, simplifying a process that would otherwise be very complex. A function to add table relations is making the recording roles a lot easier. It is not necessary to lookup from each individual field to get the table relations included in the roles. The Import Role Worksheet works like the Import of objects allowing to create or merge updated roles to the existing ones in the database. Watch this YouTube video to see how roles are maintained. The Snapshot feature in Easy Security Light offers a fast way to capture all security roles and access controls within a database and view them in one convenient form, enabling you to easily manage them. With Snapshots, you can also revert a user’s access controls or a security role to a previous version, making it easy to correct mistakes or make temporary changes to access controls and permissions. Easy Security Light contains a "Recorder" for permissions, that captures all TableData permissions simply by using the application. The Easy Security Light application is available for the RoleTailored Client and the Classic Client. Maintaining permissions for logins, recording and creating roles can all be done from the Classic or RoleTailored interface. Watch this YouTube video to see how to create Snapshots. NAV Easy Security Light is available in two versions. Both offer the same functionality; however, the free (unregistered) version limits the amount of TableData that can be recorded using the SQL Profiler. Buying Easy Security Light is as easy as contacting your NAV Partner. The Partner simply places the order with Microsoft and sends you the license for the unregistered version, free of charge. Once you have received your license, just upload it to SQL Server and import the objects. If you want to upgrade to the registered version, update information in the Security Setup within Easy Security Light, then submit the email registration to Mergetool.com. After you pay the registration fee, Mergetool.com will send you a registration key via email, which opens up the full recording feature, ready for you to use. It’s as simple as that. 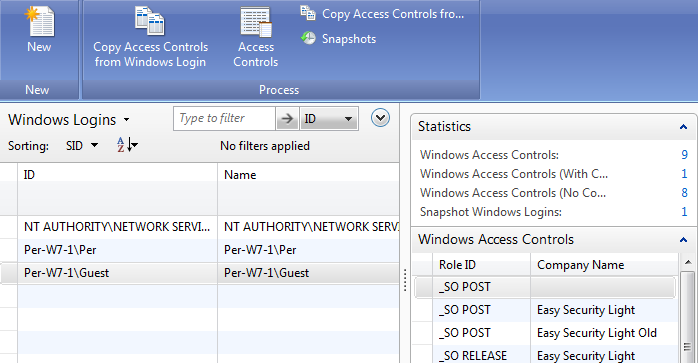 Role Center permissions for NAV 2009 R2 RAR-file ZIP-file. Permissions for all Role Centers shipped by Microsoft for NAV 2009 R2 to import with the import function in NAV Easy Security Light. If localization or customizations has changed the role centers can this be recorded with the un-registered (free) version of NAV Easy Security Light. Mergetool.com offers free, easy to access support through videos at YouTube.com, documentation, online help. Online assistance is availabel as a paid service. NAV Easy Security Light Documentation and FAQs page with installation video and other technical Q&A's. Modules and pricing for Mergetool.com Products. The Easy Security Light must be requested through your NAV partner as other modules for Microsoft Dynamics NAV. 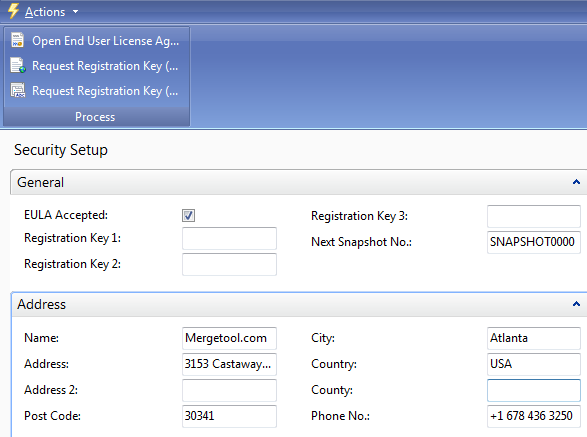 For the complete recording functionality must a Registration Key be purchased from Mergetool.com.